I'm hard pressed to find many movies anymore that interest me. But since I'm a grandfather, there are some I have to see because my grandchildren are anxious to go. It seems that every time I'm with them, we end up going to a good movie for children. I've been educated through these movies. I've learned about what animals need and appreciate. I've learned about robots and the importance of caring for the environment. I've learned that even though we may not do things like everyone else, we may have a special gift to contribute to the common good. Movies for children aren't embarrassed to teach values and raise moral questions. I guess the culture still assumes that below the age of six or seven, we still need some guidance in forming character. That brings me to one of the latest, apparently a huge box office hit, "How to Tame Your Dragon." My wife and I enjoy movies for children even without the children. Since our grandchildren live fifteen hundred miles away, and I knew I wouldn't see them before they saw the movie, we went to the "Dragon," here. We went just us seniors, in a theatre of parents and children. It's in 3D and what a great joy it was! In a time when the culture is constantly crying "kill first and ask questions later;" when members of a certain race or religion or ideological persuasion are supposed to be our natural and perennial foes; when we refuse to talk and don't know how to listen; when fear motivates most of what we do; in such a time, this movie is cultural commentary and character education for all, not just children. 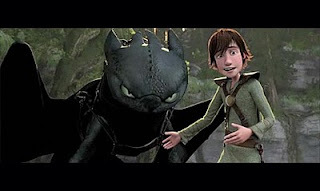 The small boy who is the main character in the movie is able to withstand the pressure not just of his peers and his culture, but also the wrath of his father, in his pursuit of a developing relationship with a befriended dragon. I don't want to say too much about the movie as I'd like you to see it, hopefully, with a youngster or the young in heart. But there's a significant line toward the end that I don't want you to miss. When asked why he befriended the dragon the small boy said, "when I looked in the eyes of the dragon I saw the same fear I felt." What an insight! And it's the beginning of ending wars and building peace. If we can only admit our fear and recognize it in the eyes of the other. Gandhi believed that one of the most significant marks of the satyagrahi was fearlessness. Working for nonviolent social change means developing a discipline for dealing with our fears. Perhaps we banish fear through prayer or meditation; perhaps through role play; perhaps through gradually engaging the adversary in trial and error. Gandhi's call for fearlessness in the pursuit of Truth reminds me of a passage in First John in the Christian New Testament. "There is no fear in love for love casts out fear." If we are working in the service of Love, there is no room for fear. Love crowds it out. 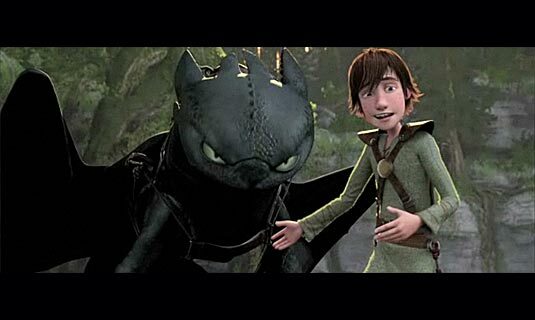 We, too, can train our dragons. Following Truth, or Love will help. They provide us the inspiration we need to face the fear and befriend our culture's fiends. Several years ago we took a group from the U.S. to India. Our purpose was to better understand Gandhi and to participate in nonviolence training. At the time, I thought of nonviolence as a method of social change. It was a technique that had proven useful in the Indian struggle for independence and in the movement for civil rights in the U.S. I had observed and experienced the way nonviolent methods had successfully brought change to the patterns of racial discrimination long fixed in our history. Now I wanted to learn more about how satyagraha had succeeded in beginning the dismantling of the British empire. 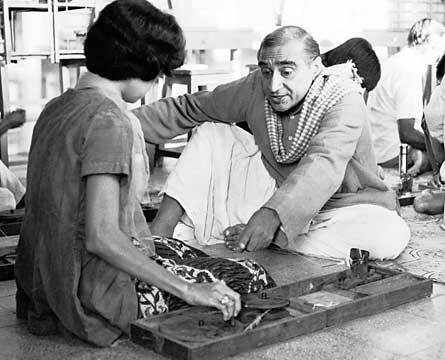 Although I had brought groups to India before, I was especially excited to learn that one of the Indian co-leaders this visit was Narayan Desai, son of Gandhi's personal secretary. Narayan had grown up in Gandhi's ashram. He had first hand experience with the father of Indian independence. He was a well known and respected activist in his own right. Our primary residence in India was to be his Institute for Total Revolution in the state of Gujarat. So twenty of us from the West joined with an equal number of participants from around India, to live, work and study together. There were four of us in the leadership positions, two from India, including Narayan, and two of us from the states. We left most of the program to our Indian hosts, as they knew the environment and resources available to us. As the days grew into weeks, I was surprised that there wasn't more emphasis on aspects of what I considered "training" in nonviolence. I was used to a western style, where we worked with affinity groups, role played situations of conflict and modeled how we would react, discussed Gene Sharp's methods of nonviolence, etc. We did none of this. Instead, we filled our days with discussions, walks, food preparation, manual labor, spinning, field visits, and on one occasion, planting rice. Rice planting was the most nonviolent, community building experience of my life. We were guided (in our bare feet) down the mud luscious field by a rope held by two guides. They walked on the raised berm that held the water in the paddy. The rope had a series of knots in it. Each of us walked by a knot, with the paddy plants in hand. When the rope stopped, we planted a rice seedling in that spot, continuing down the rows till the field was planted. There was rhythm and plenty of song for the experience. There was laughter and good humor, even when a crab would nip a toe. When the three week program was concluded, the leadership sat in evaluation. I was still puzzled. Although the program had been exceptional in building community (planting rice was a prime example), I still thought we had missed the "training" in nonviolence. Narayan spoke first. He held up the way the group had cared for the sick. One participant in particular was ill for most of the program. Members of the group tended to his daily needs. Someone was constantly at his side, people rotating delivering food, and offering companionship. 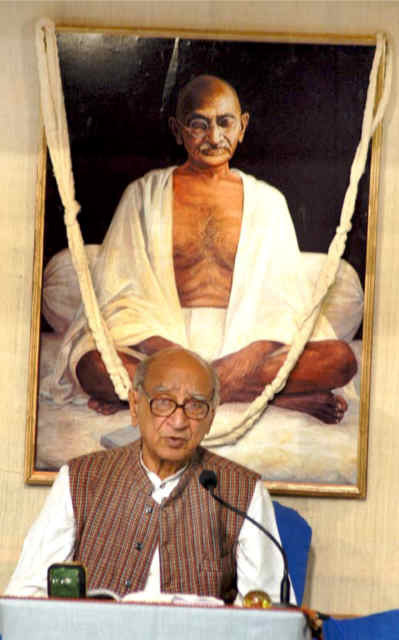 Narayan concluded this was nonviolence at its best. Slowly it began to dawn on me. Gandhian nonviolence was not just a technique but a lifestyle. Satyagrahis were not simply social activists, they were servants. They cooked for others. They planted paddy for the community. They tended the sick. They were other centered, not just in their political life, but in their personal and social life as well. This learning has informed my conception of nonviolence. There is an interior dimension to nonviolence. 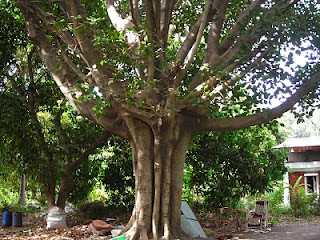 It enables one to live a nonviolent life style. Without that interior dimension, technique disappears in disappointment and dehumanization. Training in nonviolence begins in cleaning toilets and dishes for the community, in walks and spinning, in planting paddy and preparing food, and in tending the sick. That's where we transform the lives of those around us, and our self. 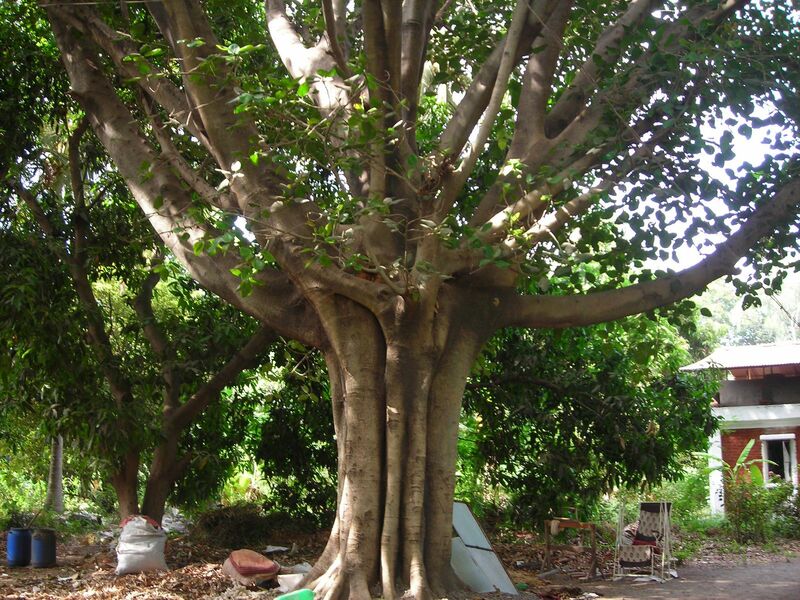 The village of Billadi in India, is about 40km away from Raipur, the capital of Chattisgarh. About 20 years ago, a group of 35 women occupied 15 acres of state land for their livelihood through a long non-violent struggle. Since then, the women have been trying to get the legal lease of the occupied land. They have also worked on developing the land for agriculture purposes. A women's society in the name of Mahila Mandal, Billadi, was registered in 1991 (under the society registration act, 1973) and they continue their struggle under this banner. Initially, these women faced problems in coming out of their homes. But through gradual and peaceful persuasion, they were able to convince their family members to allow them to do so. Now Billadi's women are free to go anywhere without any obstruction. This is a story of some of the simple but strong initiatives taken by these ordinary women to protect their land and secure their rights through peaceful means. In 2002, the women cultivated millet and sesamum on a portion of this 15 acre land. But Billadi's Surpanch (head man) sold these crops for Rs. 3000 without giving them anything in return. All the women revolted peacefully against this. Now the Surpanch also realizes that the women are aware of their rights and he cannot exploit them in this way. In 2004, Surpanch of Billadi sold some portion of the occupied land (about 5 acre) for Rs. 20 thousand to Sri Narendra Sharma, a retired army man. This prompted the women to write an application to Police Sub-Inspector, Tilda, on 28 January 2004. Narendra Sharma started cultivating paddy on this piece of land and put his nameplate "Sharma Farm House'. One day, when it was raining heavily, these women simply pulled off this nameplate and threw it away. They went back to their land and started cultivating sesamum in place of his rice. Now the Mahila Mandal spends about Rs.10000 per year to cultivate crops, but due to the barrenness of the land and its distant location they do not get much profit. Most of the neighbors let their cattle loose to graze on the crops planted by them because there is no fencing in this land and the women cannot take care of it day and night. The women have also written an application to the president of the district panchayat, against this grazing. The brave women have even faced trial in Tilda court for six months due to a notice by the Revenue Department. In order to get the lease of the occupied land, they organized a stop vehicle movement (Chhaka Jam) on the Tilda-Simga road. It was also the women of Billadi's Mahila Mandal who struggled hard to close the local wine shop. Recently, when Police arrested a villager named Jethu Rawat of village Oduan in a case of small infighting, the wife of Jethu Rawat went to Motinbai, the president of Mahila Mandal and then both went to the Police Station accompanied by four or five other villagers. After talking with the inspector they were able to get Jethu Rawat released on bail. In this whole process, no bribe of even a single rupee was given to the police. A Sarpanch of a nearby village, Udera, had built his own house on one acre of government land and when some of the poor landless women tried to plough the empty land he threatened to report them to the police. Motin Bai and Roshani Bai of the Mahila Mandal went to Udera to support the women to plough and cultivate sesamum on about 2.5 acres of land. 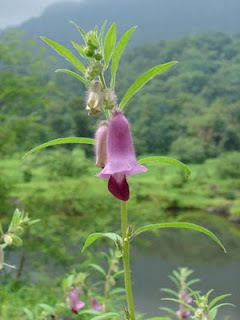 The production of sesamum was good which helped the women of Udera in their livelihood. One day, when Motin Bai went to buy sugar from the ration shop, she was told that only 2.5 kg of sugar would be given as against 6 kg. But Motin Bai had seen the shopkeeper selling 20 kg sugar to 3 persons. Angry, Motin Bai asked for a key and lock and locked his shop and said that there was no need of a ration shop in the village. The shopkeeper complained to his boss at the Block Development office. When the boss came to Billadi and asked Motin Bai the reason for her action, she promptly answered him and the shopkeeper was told not to repeat it again. In this way, women of Mahila Mandal have not only helped their own villagers but also supported the neighborhood villagers at the time of their need. At present, the Mahila Mundal is still continuing its struggle against a Power Plant, besides the demand for the lease of the captured land. 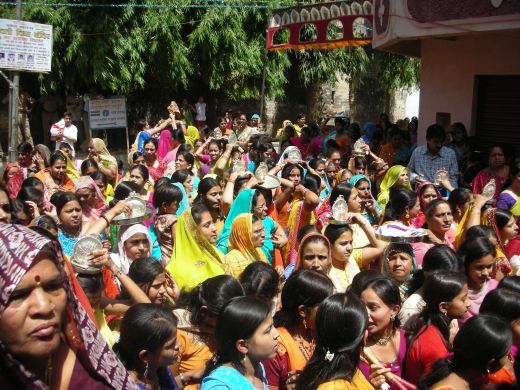 The Mahila Mandal has earned a reputation among the district and local government officials and they pay attention to the issues raised by women in favor of common people. Cesci Centre, Madurai (Tamilnadu) awarded "Maya Koyne Award" to Mahila Mandal, Billadi in 2003. The struggle for land by Billadi's women is praiseworthy. Billadi can be mentioned among those villages of India which are known for women's struggle for land and livelihood. Due to mutual understanding, non-violent struggle and right leadership of Mahila Mandal, the women have got the possession of the land. The women are still saying "Our feet are in the grave but we have firm faith that our children will use this land for their livelihood with their full legal rights." 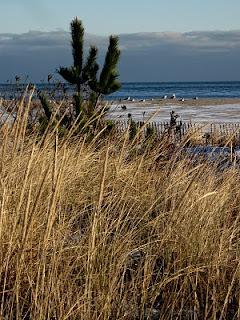 I had two experiences this week, whose connection with each other I have tried to understand beyond their proximity of time and place. I have felt troubled, wondering if there really is any connection beyond happenstance, reflecting on what joins and what divides people from each other, from self, from God. Of inner alienation, how do people do what is wrong while knowing what is right? Responding to hurt, I wondered about the imbibing of hateful stereotypes in relation to personal culpability if people really don’t know right from wrong. And in the midst of it all, what does God seek and expect of us? The first experience: Last summer one hundred Hyatt Hotel workers in Boston were summarily fired from their jobs as housekeepers, after unwittingly training their lower paid replacements. Many of the workers had been faithful employees for more than twenty years. 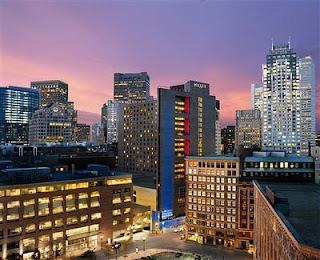 As part of a continuing interfaith effort to seek redress, I participated in a clergy delegation to meet with the general manager of the downtown Hyatt. We assembled first at a nearby union office, though unfortunately these workers were not unionized, and there met with some of the fired workers, the human face of injustice. They are all women, mostly immigrants for whom English is difficult, all struggling to make ends meet. They are the vulnerable among us -- the stranger, the orphan, and the widow of the Torah, with whom we are to deal justly and kindly. Led by a representative of Cardinal O’Malley, we made our way to the pre-planned meeting. Seated around a table spread with food and drink that remained untouched, the priest began to speak following introductions, expressing our disappointment in the hotel’s refusal to reconsider the firings. The general manager seemed to be a decent person, conveying in his body language a degree of awkwardness and embarrassment, suggesting that in the quiet of his own heart he knew that an injustice had been done. I wondered if his words about bottom line and struggling economy sounded hollow even to himself, all of us knowing that the Hyatt chain had in fact done very well in the past year. When my turn came to speak, I felt an unexpected sense of compassion for the general manager. It was a moment in which the inherent truth of nonviolent dynamics was so clearly illuminated, the way of reaching out to an opponent in such a way as to highlight shared interest, humanity, and decency. Challenging him gently but firmly to redress the essential injustice of the firings, not simply to apologize for the way in which they were carried out, I underscored the nobility of acknowledging and righting a wrong, what we call t’shuva. Rather than urging the Jewish community to participate in a boycott of Hyatt hotels nationally, now to be more actively encouraged, I told him how pleased we would be instead to help restore what has been a very positive relationship in the past. The question for all of us, not only for the manager of the Hyatt hotel, is whether we are ready to do what is right when we are challenged with difficult choices, especially in difficult times. A powerfully simple standard is offered in the Torah portion of the week of our visit through the words of Aaron (Leviticus, 10:19), who asks, would it be right in the eyes of God? The prophet Micah offers practical guidance, It has been told to you, O mortal, what is good and what God seeks of you, only to do justly, to love kindness, and to walk humbly with God. Another of the priests at our meeting had referred to these words. On our way down to the street, I shared with him how much the words mean to me, having chanted them at my Bar Mitzvah, urged by mother to add afterward to my own prayer, “and to walk humbly with people.” He too shared a connection through Micach’s words with his mother, having spoken them at her funeral. He then reflected that as an abstraction, we seem to do better with loving kindness than doing justly. The second experience: Walking away from the hotel with one of the ministers in the group, a good friend, a rather scruffy looking young man approached us. Asking if we could each give him a dollar, my friend took out his wallet and gave him one dollar. I started to reach for my wallet and then remembered that I had only a ten and a twenty, which I felt was more than I could give in that moment. While later I realized that I might have asked my friend if he could give another dollar on my behalf, at the time I apologized to the man, saying I did not have a dollar. As he turned, he muttered, “Oh, you’re Jewish.” Stunned, it was one of those exchanges that happened so quickly I could not respond. I suddenly wanted to run after the man, who had disappeared into the lunchtime crowds, and ask him to take some time so that we could talk, that I would take him to lunch. So much alienation, so much separation from what is good and what God wants of us. Jobs taken away from people without any sense of what is good in God’s eyes as a standard beyond the bottom line. Anti-Semitism and racism imbibed in the morally stagnant air of American general culture. I was left feeling sadness and compassion for this young man who seemed not to know right from wrong in his way of assessing people, even as I had felt for the hotel manager who seemed to know, but was unable to act in accord with his knowing. 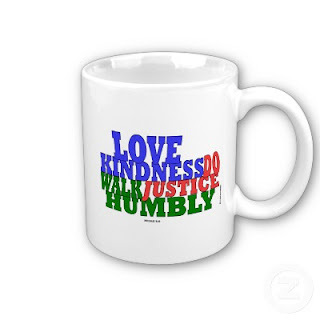 Two experiences of the past week that are one, when we are able to ask of our deeds, would it be right in the eyes of God, then we shall know that to walk humbly with God means only to do justly, to love kindness, and to walk humbly with people. Saturate: to treat, furnish or charge with something to the point where no more can be absorbed, dissolved or retained; to infuse thoroughly or cause to be pervaded. The morning is warm and sunny and the invitation to a walk on the beach is irresistible. I live far from the actual physical influence of “America” on this compact little island. Still, the disturbing news in the Boston Globe about a case of bullying that has resulted in the suicide of a young girl is on the lips of many here. With sun glittering on the water and the sound of gulls circling, diving for crabs in the shallow surf, filling my ears, it is hard for me to reflect on the devastating ways that violence infuses its way into everyday life. Last week, in a break with a longstanding resistance to viewing movies with violent themes, my husband and I watched “Inglourious Basterds”. The incredibly graphic violence played out in this “revenge fantasy” was more than either one of us could tolerate all in one sitting. We watched it chapter by chapter over a couple of days. The film was a saturation experience. We are still reflecting on the meaning of the movie and the popularity it enjoyed. Revenge of such enormous proportions, even as a fantasy, seems to have touched deep places in a lot of people. I conversed with a few friends about the film and how disturbing it was to me. From one friend I heard that, while she considers her self to be a peaceful person, she thinks there may be a place for violence in the resolving of conflict. Another friend observed that a revenge fantasy like “Inglourious Basterds” may play a role in mitigating feelings of victim-hood. Still another reflected on the artistic representation of a mirror image of the Holocaust played out in the film. I am left with the residue of saturation however, left with questions about where we are as a species in our ability to transcend what seems to be a culture saturated in violence in popular art, music, film, T.V., texting, and on and on. The bullying that resulted in the suicide of a promising teen-ager and the revenge violence in a popular movie are not all that far apart on the spectrum of violent behavior. In the midst of the saturation, it is easy to lose perspective and yet, today’s Globe moves the coverage of the tragic bullying off center page to make room for the headline photo of President Obama and President Dmitry Medvedev working toward nuclear arms reduction and control. The headlines remind me that while the deep streams of pain and hatred and revenge continue to flow through human experience, so do the streams of peacemaking make their way through human consciousness. His words are worthy of a place on my refrigerator door to bring me back into focus when the “noisy” saturation rattles my inner balance, to be brought to mind when “tea parties” and racial and ethnic and gender-biased slurs and threats of violent reprisals fill the media. Hope feeds my desire for his words to be true. Some days compel us to remember. Some days compel us to reflect, and to act. This day--April 4--is one of them. On April 4, 1967, the Rev. 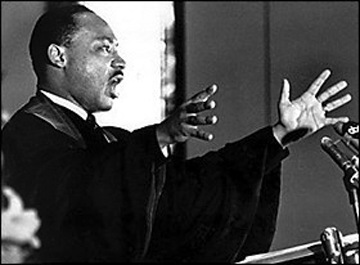 Dr. Martin Luther King, Jr., delivered his "Beyond Vietnam" speech at the Riverside Church of New York. A year later to the day, he was assassinated in Memphis, Tennessee. During the last year of his life, King suffered widespread condemnation and was abandoned by many supporters, white and black, because of his opposition to the Vietnam War. Despite the rejection and the risks, he never stopped summoning America to a "radical revolution of values." He never stopped challenging the nation he loved to "come home" from the far country of "racism, militarism and economic exploitation." Today his call is ours to answer. In the presentation offered below, which runs nearly a half-hour, King preaches "Beyond Vietnam" at Ebenezer Baptist Church in Atlanta on April 30, 1967. (The award-winning recording was edited for length.) I created this piece for a commemoration of King's death being held tomorrow in Brookings, SD. King's words, in my view, are as true today as they were when first spoken--perhaps even more so, because of the interweaving of history and contemporary events. King's passion, inspired by both love for and disappointment in his nation, resonates deeply with my own spirit. Perhaps it will with yours as well. You and I have much work to do, my friends. Let's keep on keepin' on.